No items were found with your requested search criteria. We're pleased to release these premium Five Star Flag Flagpole Kits. These top-of-the-line flagpole kits are extremely suitable for commercial buildings or upscale residences. Top Shelf Kits We've chosen the best materials and components to make these flag pole kits strong and good looking. Single piece poles are always stronger than two piece poles! 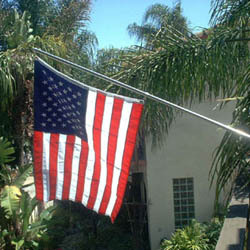 Choose either 3' x 5' premium Nylon or Professional Grade Woven Poly USA flag. Choose either 3' x 5' premium Nylon or Professional Grade Woven Polyester USA flag. The rust-proof aluminum caps and bottom ends come with high tensile strength stainless steel beaded chain to attach your flag to the pole. The beaded chain is threaded through the top cap and held within with a large bell. The flag is able to spin around the top of the pole and move freely and without the risk of it wrapping around the pole and furling in on itself. You have your choice of poles. 1-inch Stainless Steel Pole- Stainless steel is known for its strength and ability to look good for years. Our single-piece 60-inch pole is a thick-wall 1-inch outside diameter stainless steel pole. The Anti-fouling cap fits perfectly to the top of the pole. 3/4 inch 6061 Aluminum with a very thick .125 wall makes this a super strong pole. This is a three-piece machined aluminum set, along with a stainless steel beaded chain. The Anti-fouling Bottom End is locked into place with an allen-head set screw. Use the beaded chain to attach to the lower grommet of your flag. A Flags of the World sponsor.